The blatant infractions on basic protocols by the CIA culminated in unsuspected attack with devastating effect. The central downfall in this instance was exactly the nature of human intelligence – it was simply human error. A combination of anxiety, anticipation, and an eagerness to follow through with the assigned mission directives made the usually methodical and careful CIA agents overlook the basic procedures that had allowed them to feel so invincible. 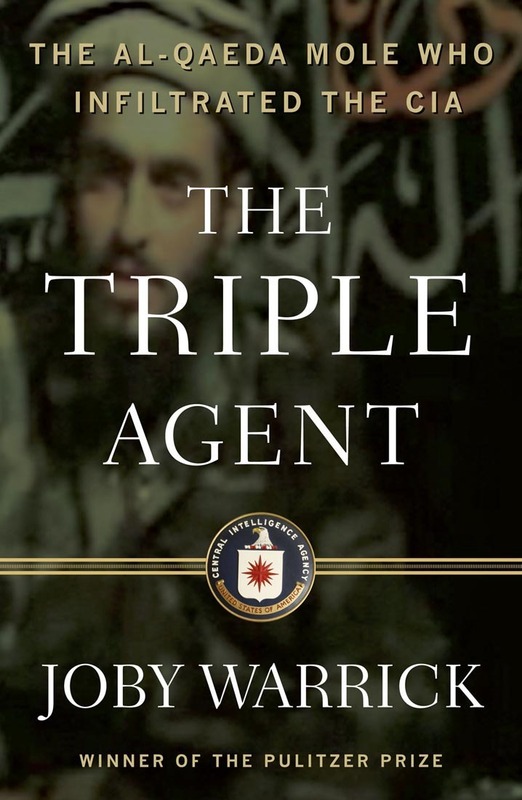 The mistake on the part of the CIA was that in their excitement in learning about and then pursuing al-Balawi was that they put all of their eggs in one basket – or rather put too many officers in one building with their informant. 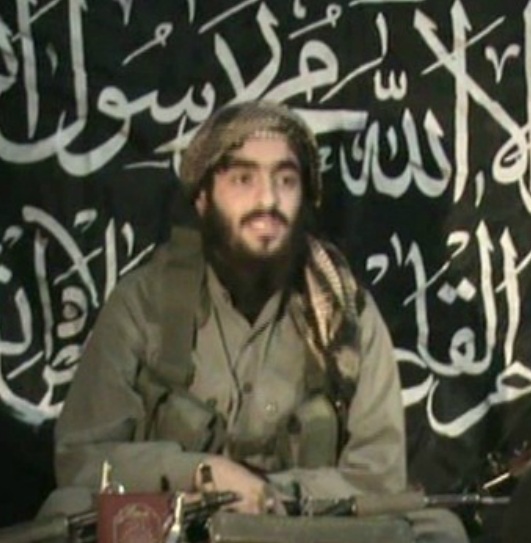 The plan penned by the Pakistani Taliban and al-Balawi is not in itself all that sophisticated on their end. It relied more upon the naïve enthusiasm of an American intelligence community wearied by war. The CIA lulled themselves into a false sense of security due in part because of the rigorous and comprehensive security minded pre-requisites and checks they had. It was the long-term success of these compiled policies that facilitated this almost complacent mindset that would precipitate the environment in which this attack would occur. This scenario involved a breakdown at numerous levels. However, the extent of the breakdown becomes greater the closer the contact with the Jordanian al-Balawi became. It seems almost like a given fact that the President of the United States or the Director of the CIA would react to this sort of potential scenario in a given manner. With as many irons in the fire as the American intelligence community, let alone the CIA has, that orders would be given with an imperative tone in regards to the potential success of the unfolding mission. This type of action has been taken in the past and will continue to be taken in the future. What has to be examined is, what I feel to be, the two other factors/variables: the Jordanian intelligence contact and the actual CIA handlers in Khost. It is no secret that the Jordanian intelligence service is easily one of the preeminent forces in the Middle East; and because of that America is lucky to count it in its allies. America is really just unable to jump into Jordanian intelligence affairs and tell them to implement reforms suited to what we see as our mission. Since this is a realized implausibility, the proper course of action is now just to alter how our interactions with the Jordanians are conducted. This is seemingly the only way we can account for a needed change. 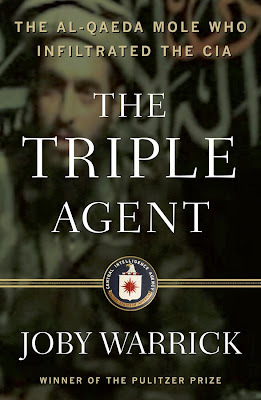 Ultimately, the central fault on behalf of the CIA was because of the agents on the ground. As far as actual recourse or discipline for the involved members, that is not a possibility because sadly and unfortunately the people at fault were also the ones who met their ultimate demise in the attack. But this is also groundwork for a learning exercise of why the basic security checks are such a central part to maintaining the integrity and safety of the CIA agents and the bases. Granted there was quite an extensively fabricated background suggesting who al-Balawi was supposed to be and also what he was supposed to potentially yield – all of that could have been undone by simply following basic protocol. Yes, there are the occasional breakdown leading to a massive failure along the like of al-Balawi and Khost. While this was the single deadliest attack on the CIA in nearly 2 decades, over the history of the Agency, coldly put, it still averages out to a fairly high success rate. Whether the deep progress into Chapman Base in Khost, Afghanistan made by al-Balawi was a result of intimate knowledge with CIA handling protocols or rather just an attack of the greatest opportunity; the engrained necessity in the CIA to keep meetings and interactions with contacts as clandestine as possible unwittingly circumvented the infrastructure of security protocols designed to prevent this type of attack and infiltration from happening. Here is a brief 5 minute clip from the film Zero Dark Thirty. This scene is a depiction of the events that transpired at the CIA station in Khost on that fateful December day in 2009. The depiction of the suicide attack in the film is a great emulation of how Joby Warrick describes it in his book. I feel this adds educational and commentary value to my critique. In the scene's dialogue, you can clearly hear the pleas by the female station chief to bypass regular security protocols. I wrote this analysis for a course I took called '9/11 and the War on Terror.' This policy memo served as our term paper, in lieu of a traditional final exam. Our assignment was to examine an aspect of the war in Afghanistan. I chose this topic because of my Canadian roots and my interest in NATO. 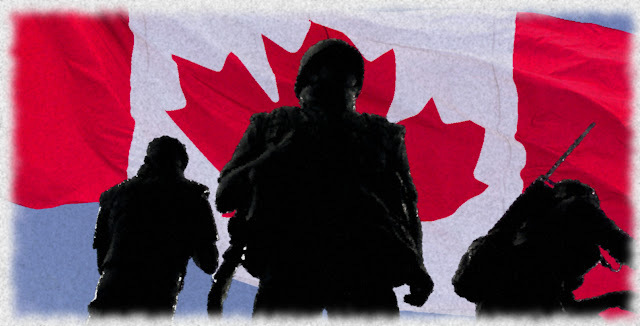 Learn how early friendly fire incidents and experiencing the highest proportional rate of fatalities amongst active ISAF partners provided Canada’s policy makers with adequate justification for actually expressing the public’s will in regards to reducing military engagement. However, an analysis of public opinion, voting trends, and implemented policy clearly demonstrate Canada’s commitment to NATO and ISAF, even amidst the Afghan disengagement. The first Canadian casualties in the Afghanistan war were inflicted as a result of friendly fire. A U.S. F-16 fighter pilot bombed a staging area for a Canadian training exercise in a location known as the Tarnak Farms. This incident happened just over six months into the Afghan war. By examining the background of this friendly fire incident, insight to the continued Canadian commitment can be gleaned. Furthermore, Canada has experienced the highest proportional rate of fatalities amongst active ISAF partners in Afghanistan. Canadian policymakers proceeded to utilize this information when they reduced troop levels at a time when the U.S. was planning a troop surge. 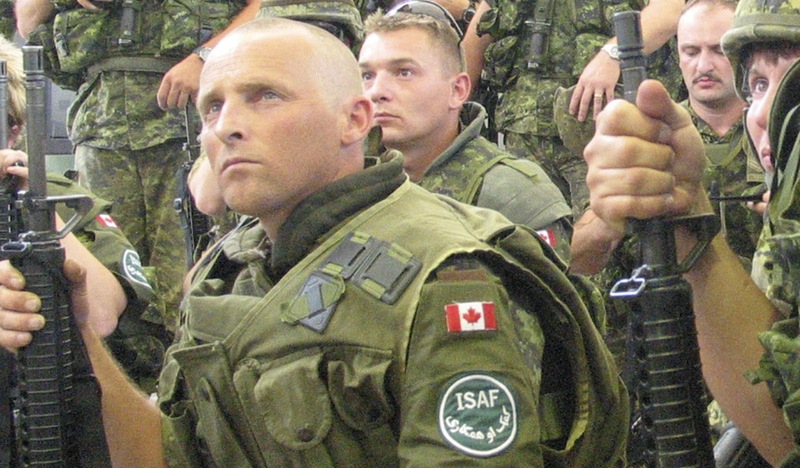 This reality altered and shifted Canada’s role with ISAF in Afghanistan. Canada then began disengagement in Afghanistan and reverting to a support role in the ISAF mission. Public opinion polls taken in Canada after the 9/11 attacks concerning U.S. – Canadian relations and of the war in Afghanistan under the Stephen Harper government will illustrate the opinion landscape. From there, government policies will be examined for mention or justification vis-à-vis public opinion. Historically, Canada and the U.S. have shared the world’s largest economic relationship. They also share the world’s largest border. Canada’s empathy for the 9/11 terrorist attack against the U.S. will also be represented in public opinion polls. So it seems as if Canada must continue to support their southern neighbors in endeavors of war as a way to bolster other more beneficial channels. The relationship Canada has with the U.S. appears to be one based upon ideological obligation, rather than one of true support. So it appears that friendly fire incidents, while not the U.S.’s intentions, and a higher rate of soldier deaths provide Canada’s policy makers with adequate justification for actually expressing the public’s will in regards to reducing military engagement. Similarly, voting patterns for the national government are indicative of the waning support for the war in Afghanistan. The elections in Canada in 2008 and 2006 will provide data as to how Canada voted in a post 9/11 political theater during the lead-up to the U.S. surge. The analysis and evaluation of public opinion, voting trends, and implemented policy clearly demonstrate Canada’s commitment to NATO and ISAF, even amidst the Afghan disengagement. According to the Canadian Minister of Defence, the first Canadian personnel to arrive in Afghanistan was, “approximately 40 JTF2 (Joint Task Force) Operators on the ground in Afghanistan, in or around Kandahar.” As the force build up in Afghanistan continued into 2002, Canada was fully compliant with ISAF military directives and they fought alongside their American and ISAF counter-parts. NATO assumed command of ISAF on August 11th, 2003. After the change in command, Canadian forces began their contribution to NATO, Operation Athena. Based in the capital, Kabul, and later expanding to Kandahar Province, Operation Athena focused on peace building exercises and civilian population interaction. During a Canadian only training exercise in April of 2002, Canadian forces would be dealt their single largest troop loss since the Korean War. The absolutely tragic nature of the Canadian loss was multiplied by the fact that it was “an American F-16 fighter jet [that] dropped a laser-guided 225-kilogram bomb” on the Tarnak farms training area. The devastating result was a total of 4 deaths and 8 injuries, marking the first loss of Canadian forces in the Afghan War. There was a major outcry from the Canadian public and outrage from government officials. Once more details about the tragic friendly fire incident were revealed, the anger grew. There was even public criticism from the Canadian military that was directed at the U.S. forces. General Ray Henault, Canadian Chief of Staff, immediately stated that, “Without a doubt, there was a misidentification of the Canadians and what they were doing on the ground and that was obviously the cause of this accident.” In response, President George W. Bush offered a public apology for the tragedy and commended and thanked the Canadian forces for their continued support. A research paper that I wrote was selected for publication in the OU Religious Studies Student Journal. 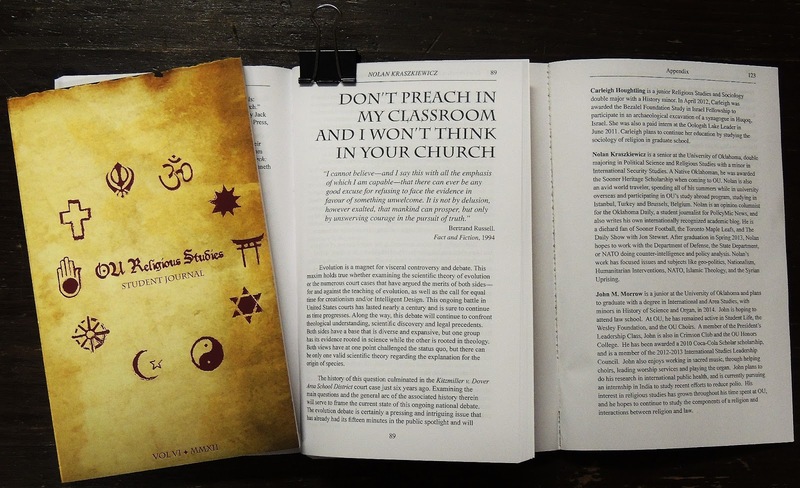 This academic journal is published by the University of Oklahoma's Religious Studies Program. It was quite an honor to have my research selected for the journal. I take pride in my work and struggle to make it compelling and robust. This was quite a personal accomplishment in my academic career, as well as a nice addition to my CV. Currently there is not an electronic version of the journal available for public perusal and the copies of the journal I am in possession of are limited for family and friends. Inquiries can be made with the University of Oklahoma's Religious Studies Program for a copy. On a more intriguing note, I have made available the research paper in the journal available here on my website - in the New Published Work section. The paper takes a look at the debate raging over evolution verses creationism and, more recently, Intelligent Design, and also analyzes the outcomes and implications of this contentious subject. However, on a quite ironic point, as an atheist, it is quite an achievement to have my work on the subject of religion recognized in Oklahoma, in the heart of the 'Bible Belt.' I feel like this aptly represents the depth of my convictions. My disdain towards religion is not simply rooted in rebellion or defiance, but rather it is an understanding of its many elements. A person is entitled to their beliefs as their conscience dictates. I just like to make sure that a person really knows what they are talking about, regardless of their beliefs. I will engage in a discussion regarding a critique of Christian belief just as eagerly as when I aim to correct a misconception from a fellow disbeliever. Lastly, I am again a member of the Religious Studies Club at OU this year. As the officer in charge of publicity, I am charged with the creation of the club's t-shirt. They are available for purchase and can be ordered anytime now until March 31st and they will be in around mid April. The cost of the shirt is $15 - and I can setup an invoice for electronic payment via PayPal and ship it if we cannot meet in person. They are 100% cotton and available in sizes S-4XL. Here is the link for the order form. Once you have ordered a shirt, e-mail me and once I verify the order, I will send you the invoice and delivery information. I really appreciate the support for the Religious Studies Club!